The 2015 Infiniti QX50 luxury crossover once again provides a unique expression of personal style – combining a right-sized sculpted exterior, a luxurious interior environment and suite of advanced technology features. The QX50 also delivers both a rewarding driving and ownership experience, with a standard 325-horsepower 3.7-liter V6 and Infiniti Personal Assistantä 24-hour live concierge services. The 2015 Infiniti QX50 is available in QX50, QX50 Journey and the QX50 AWD and QX50 AWD Journey featuring Infiniti’s Intelligent All-Wheel Drive system. Also offered are three special equipment packages: Premium Package, Deluxe Touring Package and Technology Package. The QX50’s exterior combines the look and feel of a luxury coupe and a crossover’s flexibility. Its sporty proportions include a long hood, short front and rear overhangs, roomy cabin and a smooth, coupe-like roofline. Along with its excellent around town maneuverability, the wide rear hatch and low load floor make the QX50 a versatile performer for both everyday and weekend use. The exterior includes many signature Infiniti touches, including a double-arch grille, large L-shaped headlights, available xenon auto-leveling headlights with Adaptive Front lighting System (AFS), integrated fog lights, distinctive LED taillights and “dynamic arch” profile. Other exterior features include a high-mounted rear hatchback spoiler with integrated brake light, chrome-finished dual exhaust tips, an available power sliding tinted glass moonroof with tilt feature, sliding sunshade and one-touch open/close (standard on QX50 Journey models) and available roof rails. The QX50 also features a standard courtesy light integrated in the driver’s outside mirror as part of the hospitality lighting concept. Six exterior colors are offered for 2015: Malbec Black, Midnight Garnet, Graphite Shadow, Liquid Platinum, Black Obsidian and Moonlight White. The QX50’s dramatic interior offers an invigorating and engaging environment, one that is both indulgent and inspiring. The driver-focused cabin layout features an Infiniti signature “double-wave” instrument panel, easy-to-read high-contrast gauges, hospitality lighting with a pin LED light mounted over the center console and Infiniti signature analog clock. The instrument panel also features a 7-inch color display with Infiniti controller for the trip computer and additional vehicle information, including the available Infiniti Hard Drive Navigation System. Other technology systems include Bluetooth® Hands-free Phone System, Infiniti Intelligent Key with Push Button Ignition and SiriusXM Satellite Radio (SiriusXM subscription required, sold separately). Comfortable seating is provided by an 8-way power driver’s seat and a 4-way power passenger’s seat. A driver’s seat memory system is also offered, along with heated front seats (standard on QX50 AWD and QX50 Journey models) and an 8-way power front passenger’s seat. Also available is a power remote up-folding feature with dual controls (operated from the front or the hatch area) for the 2nd row 60/40 split seat. The interior is offered with standard premium leather-appointed seating surfaces, available in three colors – Graphite, Wheat and Chestnut. There is also a leather-wrapped shift knob, and leather-wrapped steering wheel includes controls for audio and cruise control. 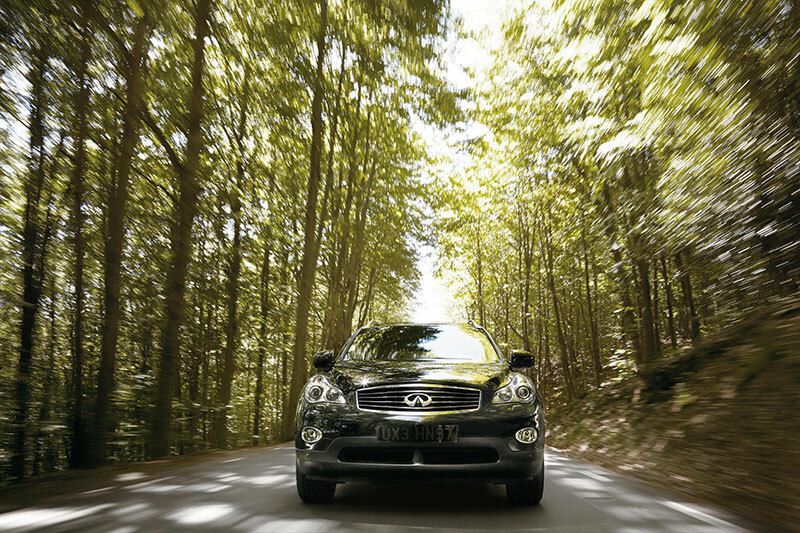 Infiniti QX50 models feature aluminum interior accents, while QX50 Journey models offer maple interior accents. The available Bose® Premium Audio System includes 11 speakers (including 2 subwoofers), AM/FM/CD in-dash changer and USB connection port for iPod® and other compatible devices. The advanced Infiniti Hard Drive Navigation System includes Voice Recognition (VR) for audio and navigation, NavTraffic with Real-Time Traffic Information, NavWeather with Real-Time Weather Information (SiriusXM subscription required, sold separately) and Streaming Audio via Bluetooth®. The advanced Around View® Monitor (AVM), available with the Premium Package, utilizes four small cameras located front, side and rear to give the driver a virtual 360° view of the outside of the vehicle and help aid when parking. The AVM system includes Front and Rear Sonar. Under the QX50’s dramatic body is an equally advanced platform and powertrain. The FM (Front Midship) platform helps provide high levels of handling performance. 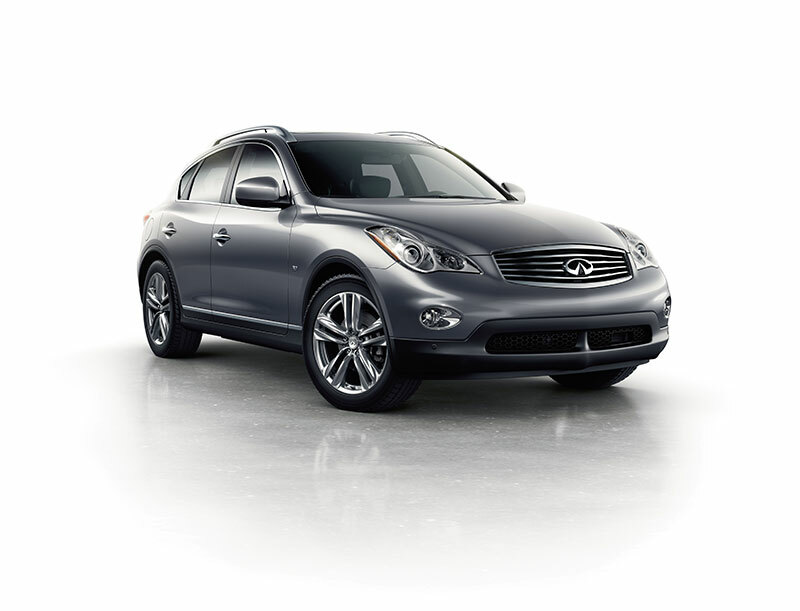 Every 2015 Infiniti QX50 comes with a VQ37VHR 3.7-liter V6 engine rated at 325 horsepower and 267 lb-ft of torque. The engine is matched with a 7-speed automatic transmission with manual shift mode, DS mode with Downshift Rev Matching (DRM) and Adaptive Shift Control. QX50 fuel economy is rated at 17 mpg city/25 mpg highway for rear-wheel drive models and 17 mpg city/24 mpg highway for all-wheel drive models. Superb handling is provided by a subframe-mounted independent front double-wishbone suspension with aluminum-alloy upper and lower links, high-performance Dual-Flow Path® shock absorbers and stabilizer bar. The rear suspension is an independent multi-link design with aluminum-alloy upper and lower links and axle housing, high-performance Dual-Flow Path® shock absorbers and stabilizer bar. Available wheel and tire combinations include standard 18-inch 8-spoke metallic finish aluminum-alloy wheels with 225/55R18 all-season tires or optional 19-inch split 5-spoke aluminum-alloy wheels with 245/45R19 all-season tires (Deluxe Touring Package). Also standard are 3-point ALR/ELR seat belts (driver ELR only) and front seat belts with pretensioners and load limiters and adjustable upper anchors, front seat Active Head Restraints and the LATCH (Lower Anchors and Tethers for CHildren) system for the rear outboard seating positions. The QX50 also features advanced Zone Body Construction with front and rear crumple zones to help disperse crash energy around the passenger compartment. Available as part of the Technology Package is the Blind Spot Warning (BSW) system. BSW illuminates an indicator light if another vehicle is detected in the blind spot area. If the driver then uses the turn signal, the indicator flashes and an audible warning sounds. 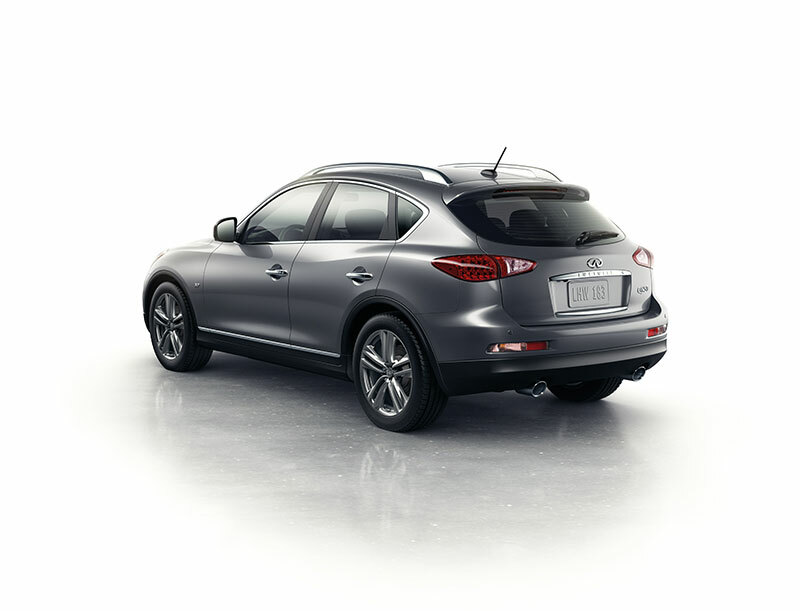 The 2015 Infiniti QX50 is available in four models: QX50, QX50 AWD, QX50 Journey and QX50 AWD Journey. QX50 Journey models include power sliding tinted glass moonroof with tilt feature, sliding sunshade and one-touch open/close, auto-dimming inside mirror, HomeLink® Universal Transceiver, maple interior accents and power tilt/telescopic steering column. Heated front seats are added on QX50 Journey models (standard on all QX50 AWD models). Just three option packages are offered for 2015 QX50 Journey models. The Premium Package includes the Infiniti Hard Drive Navigation System with NavTraffic with Real-Time Traffic Information, NavWeather with Real-Time Weather Information (SiriusXM subscription required, sold separately), Voice Recognition for audio and navigation, Streaming Audio via Bluetooth®, Bose® Premium Audio System with 11 speakers including 2 subwoofers, Around View® Monitor (AVM) including Front and Rear Sonar System, Advanced Climate Control System (ACCS) with Plasmacluster® air purifier and aluminum roof rails. The Deluxe Touring Package features 19-inch split 5-spoke aluminum-alloy wheels with 245/45R19 all-season performance tires, High Intensity Discharge (HID) xenon headlights, Adaptive Front lighting System (AFS), dual occupant memory system for driver’s seat, outside mirrors and steering wheel, entry/exit assist for driver’s seat and steering wheel, outside mirrors with reverse tilt-down feature, 2-way power driver’s seat lumbar support, coat hanger on driver’s seat head restraint, 8-way power passenger’s seat and power up-folding 2nd row seats. The Technology Package features Lane Departure Warning (LDW) and Lane Departure Prevention (LDP), Intelligent Cruise Control (Full-Speed Range), Distance Control Assist (DCA), Intelligent Brake Assist (IBA) with Forward Collision Warning (FCW) and Blind Spot Warning (BSW) system.